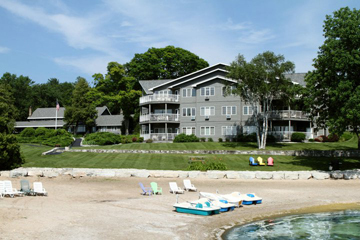 The Bay Shore Inn, as you can see, is right on the water in Sturgeon Bay, and enjoys a beautiful vista, year round. The suites abound with space and gracious décor. 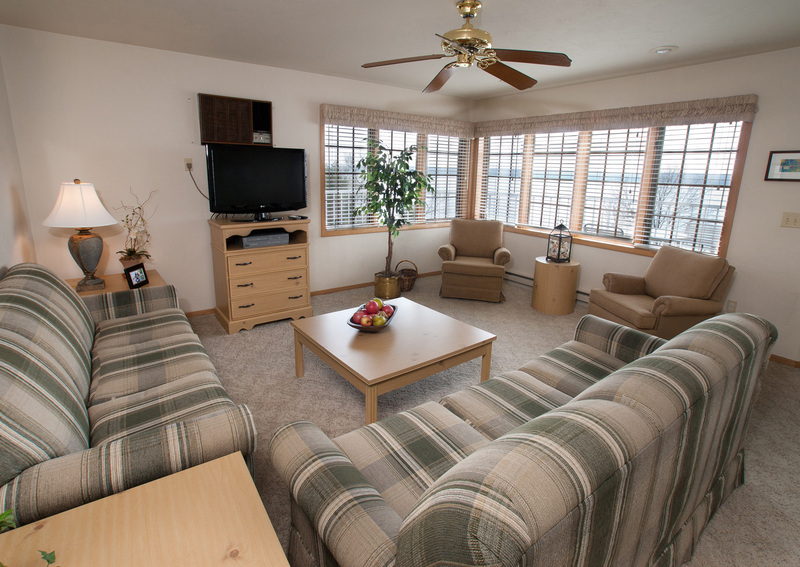 These are large suites, with a living room and dining area, full kitchen, whirlpool tubs, and separate bedrooms. This is one place that will remind you of the comforts of home, with the convenience of a first-class resort. TVs with VCRs and cable are also provided, as well as complimentary use of bikes, row boats, paddle boats, and even a tennis court! This is a great spot! Located in the main building, which was built in June of 1922, is a wonderful sitting room, with knotty pine walls and an exposed wood beam ceiling. Filled with books and a nice fireplace - it is truly impressive, offering a warm and cozy welcome. It is filled with Old English charm that gives it a comfortable B&B feel. With a wood-burning fireplace as its focal point, made with beautiful fieldstone and standing from floor to ceiling, the room also offers floor-to-ceiling book shelves filled with reading material ranging from editions of Reader’s Digest condensed books to documentaries of Benjamin Franklin and Andrew Jackson. You’ll also find a real nice selection of videos, complimentary to all guests. We really like this room. The furnishings, which compliment the room perfectly, include vintage high backed chairs, an old rocking chair, comfy love seat, a braided area rug, wood box and local artwork gracing the walls. At the rear of this room you’ll find two sets of French doors that lead to a bright and airy enclosed "porch" or sunroom. It faces the West, affording it a unique vantage points to watch a fabled Door County sunset over the waters of Green Bay. Tall porch windows line the West wall and there are sets of wicker furniture placed in front of them offering a perfect place to have conversation with friends, or a more intimate experience with that special someone. The walls and ceilings are whitewashed and the wood floor is lightly stained. With plenty of green plants and more local artwork hanging on the walls, this room is very cheerful and comfortable . . . just like Grandma’s house! Located adjacent to both the sitting room and enclosed sunroom is perhaps Door County’s only waterfront conference room. Accessed by doorways from the sitting room and sunroom, it can accommodate up to 110 guests. We talked with staff member Judy McMahon who told me that the facility works great for family reunions, weddings, corporate retreats or business conferences. We can see why. This unique and beautiful setting is complimented by a very generous and helpful staff that can assist you with planning any group activity, arrange catering and provide up-to-date audiovisual equipment. What a way to go! We met with the manager and toured this wonderful Inn. There is a pleasant and relaxed attitude that every staff member we met portrayed, which really mirrors the image and feel of the entire facility. 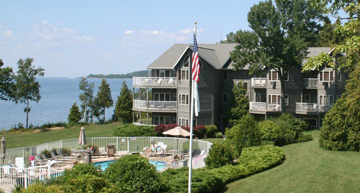 Bay Shore Inn prides themselves on loyalty and supreme customer service. Much of the staff has been here for 15 years or more, a rarity in the inn business. Gosh! They have a guest who has been coming for nearly 70 years! Now that’s loyalty! There are many offerings from one and two bedroom suites, to the Deluxe and Supreme suites. A cottage is also available. The suites have water views, which is always a joy in Door County. The one and two bedrooms have a living room, and dining area for 4. The one bedroom has a king bed and balcony (nice!) while the two bedroom has two baths (one has a whirlpool), king beds and a deck. In rooms with more than one bedroom there are TV’s in each bedroom as well as in the living room. Every room is nice a bright and cheery with lightly stained furniture, floral patterned couches and love seats and overstuffed sitting chairs with ottoman’s. The kitchens are nicely designed with breakfast bar/counter and stools. Very clean and nicely equipped with dishwasher, refrigerator, stove/oven, microwave and coffee maker. The ceiling is bordered with a fresh fruit pattern of pineapples, grapes and cherries that sets of the room nicely. What’s deluxe about the Deluxe? Larger bedrooms (2), of course a water view, 2 private baths (very nice), dining to accommodate 6 and a large deck too! Can it get any better? The Supreme two-bedroom suite is the best available! Our favorite. This is the ultimate suite, with over 1,600 square feet! It has a great kitchen with breakfast/cocktail bar, dining room table for six, two full sized sofas, two overstuffed chairs, a coffee table and wrap around deck. The master bedroom is really impressive. It has a king sized bed with two lounge chairs, end tables, entertainment center and an awesome view of the Bay. As we looked out today on our tour, we have a really cool view of the North coastline. The master bath has a main room with double sinks, double whirlpool bath, full tub and a shower. It also has a separate area with a sink and make-up mirror and a walk in closet. This, and all the suites, are tastefully appointed with artwork from local artist such as Kari Anderson, Karsten Topelmann, Fred Bridenhagen to name a few. If you want a cottage, you can have one! There is a 3 bedroom with 2 baths (one with a whirlpool), full kitchen, dining for 6, a fireplace (nice) and a private entrance. Check out their website for current rates for each. What else can entice you to stay? How about their own private sand beach, where you can use paddleboats or rowboats on the house! Take a complimentary bicycle and ride a bit. Tennis anyone? Yes! There’s even a basketball court where you can shoot some hoops. Stroll through rich gardens, or walk along the water, splash in the outdoor heated pool, or lounge at the indoor pool or soak in the hot tub. At night, you can check out the bonfire and toast marshmallows. Wow — I have to stop writing this and get back there — it’s sounding as good as it really is! This is a smoke free environment, and they have handicapped units, while children under 6 stay free! All in all, the Bay Shore Inn reminds us of that cool lodge where the film, "Dirty Dancing" was shot. Remember? That place was a really nice place to stay for unparalleled comfort and so is the Bay Shore Inn no matter what the season! You might just want to call them now and book a reservation. This place is very nice! Live it up! 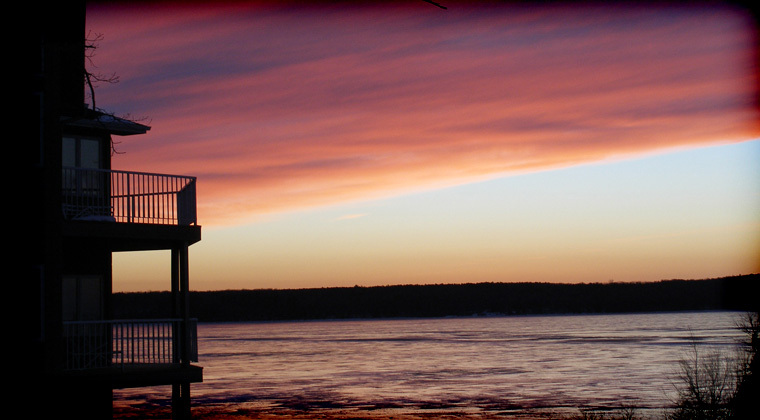 Stay here on your next trip — and tell them you found them on Door County Navigator.com. Have fun! Refer to Property ID # DCNAV-4205. Visit their website right now! The views are fantastic! And Bay Shore Inn is open in winter too!